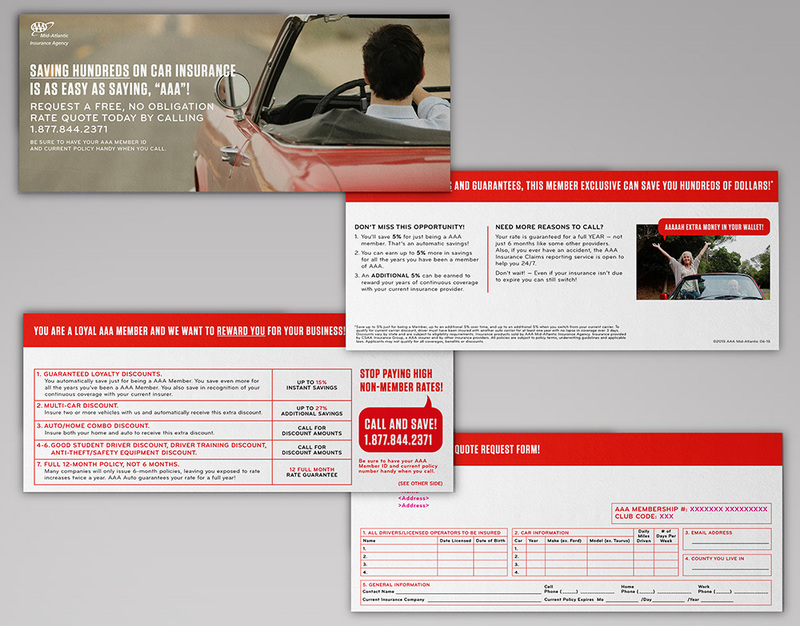 Create a direct mail campaign that entices prospective clients to call the call-center, switch and save money on auto insurance. This test kit would be simultaneously tested against AAA’s 9-year standing control kit. In the previous 9 years, the control has outperformed all other test kits. AAA is looking at measuring two very specific numbers: call volume and conversion rate. The control and test kits each contain a unique phone number within the call to action so volume metrics are not cross-contaminated. That number is further tracked into those potential customers that then convert into new AAA customers. After reviewing the control kit, we found it to be copy-heavy with extraneous information, making it cumbersome to find and fulfill the AAA call to action. Our approach was to simplify the overall kit to its most important components. 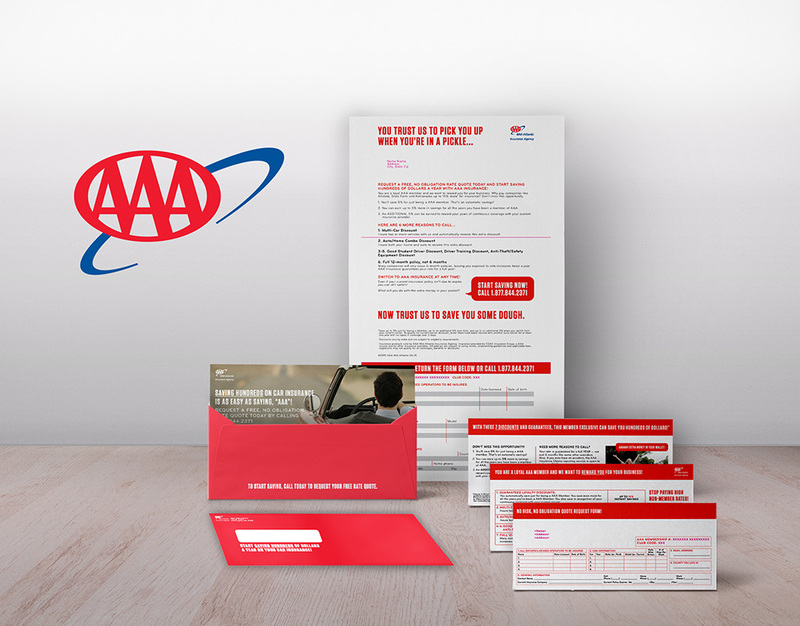 Updating the look with AAA’s new brand identity entices the prospect to open the kit, and employing a conversational and minimalist approach to copy beginning with witty headlines keep the reader engaged through the condensed test kit. All above tactics are then punctuated by a large, easy-to-find and repeated call to action. 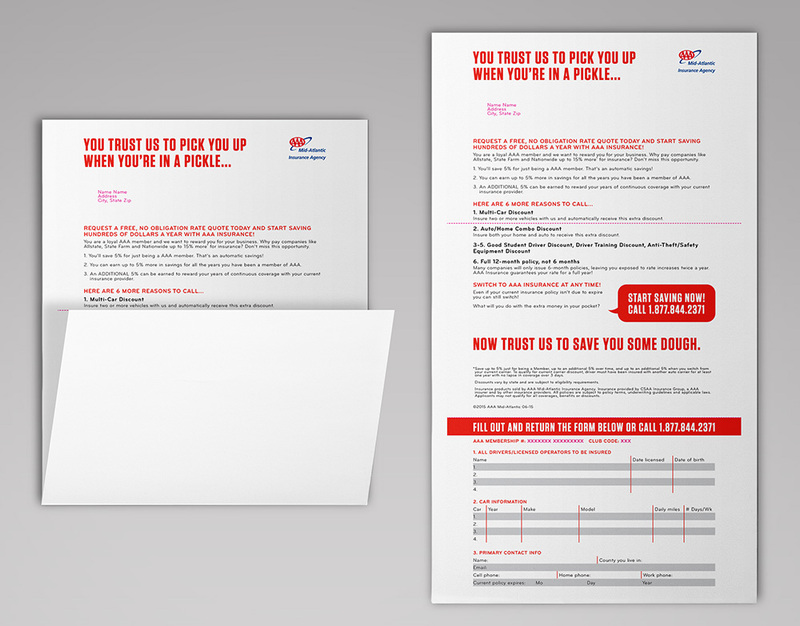 Our test kit exceeded AAA’s expectations and drove more calls to their designated call-center. Calls were up .08% to be exact, an increase never seen in the previous 9-year test run! However, the conversion rate did not outperform the control kit, which still revealed an interesting result. It turns out an entirely overlooked demographic, a younger demographic, was interested in the product but AAA’s pricing needed to be adjusted to suit this target audience. This finding generated an internal conversation that AAA not only had been working under a decades-old understanding of the market, but now lead to an exciting discussion of how they could reach this demographic. Armed with this insight, AAA has new goals to better target their pricing at this previously overlooked market. Not all projects are an initial win for us. But if the result leads to helping our clients discover a new market-base and/or generate conversations on how to better align within the ever-changing market, we still consider it a win! Oh and bonus, AAA has continued with the test kit, dropping another 100,000 and asked us to build an online component to create excitement around the test campaign.